Two weeks ago we talked about the danger of doctrines coming in and choking the life out of the truth. Men love their traditions, and it is so easy for traditions to come in and become more important than the Word of God. We men like to think that we are important, and so we like to make rules that bind people, or even more sinister, we make rules that we claim clarify God’s rules. Soon, we spend more time enforcing our rules at the expense of the Bible. Today we will deal with the importance of one particular foundational doctrine. This may seem trivial to many in the church world today; but like any home, if the foundation is weak, then the whole house is weak. The NT churches around the globe and in North America are under attack and will continue to be under attack until Jesus comes. The only way that we will withstand the stormy future that is coming upon us is if we have a sure and secure foundation. This is the dividing line in the sand for true Christianity versus false doctrine. This is the question that I ask people who tell me that they are saved in Christ. I ask them, “Who is Jesus?” A true Christian will know this. The Spirit of God in them will identify to them who Jesus is. A small child may not know everything about life, but they will know their parents: their voice, their feel, their smell and even their heart beat. They can identify who the parent is. This is an important step in salvation. One must take responsibility for one’s beliefs about God. It does not matter what your parents did, that they took you to Sunday school or that Dad was a preacher, a deacon or a missionary. “Who do you say Jesus is?” This is the proverbial ‘shoe hits the road’ moment. You and I must take responsibility for our beliefs about Jesus. There is a doctrine out there that teaches that God has chosen a select group to be saved and all others will perish. It is the doctrine of Calvinism. However, the Bible teaches that man was designed with the ability to choose God or to reject God. From the very creation, God gave man choices. Adam was allowed to eat from every tree of the Garden, but not the ‘tree of the knowledge of good and evil’ (Genesis 2: 15-17). The tree was put there so that they could have a choice. God is not interested in robotic allegiance; He wants someone to choose Him, to choose to worship, obey and love Him. If we were to research the OT scriptures, we would find that only two offices in Israel were anointed: the office of High Priest and that of King. Anointing was the act of pouring oil on a person to signify God’s choice and blessing on their call to either the office of High Priest or King. In Leviticus 8:12 we find Aaron being anointed as High Priest, and in 1 Samuel 16:13 we find David being anointed as King. Jesus is the fulfillment of both of the offices. He is our High Priest and He is our King. More accurately, He is the rightful King of Israel, from the tribe of Judah. In Hebrew 4: 14-18, he is called our High Priest. But further beyond that, Peter identifies Jesus as the Son of God. We had established back in chapter 3 that God has called Jesus His Son, and we learned in John 5:18 that when Jesus identified himself as the Son of God that the people took up stones to kill him for blasphemy, since claiming to be the Son of God made Him equal with God. So here we have the complete summation of Jesus made for us: He is our High Priest and King, and above all that He is God. As our High Priest, only He can approach the Mercy Seat of God for the atonement of our sins. Thus it is pointless to pray to Mary or any of the Catholic saints. They are dead and they cannot hear you. Only Jesus is our High Priest and only He can approach God for you. As our King we can be assured that He is in charge of everything that is happening, whether it appears to be ‘good, bad or ugly.’ As our King we can be assured that He cannot be defeated. What appeared on the surface to be a defeat, the Cross, was and is the greatest military victory in the history of man. In man’s war the generals send the foot soldiers out to fight, and they live. In this war the General went to the battle for us, was killed and then was raised from the dead by God to give victory to all the soldiers. There is certain clarity that comes to us when we allow the Holy Spirit to come in and take over. We begin to see the world in ways that we simply could not have before. One of the ways that our eyes are opened is that we see and understand who Jesus is. We understand and believe that He is God, and that belief is fundamentally unshakable. With the exception of Judas who betrayed Jesus, all of the apostles, including Paul (who began by hating the people of Jesus), died for the cause of Christ. They went to the grave, some by very painful methods, attesting to the fact that Jesus is God. Now we live in a world of fanaticism. We see it every day in the news: men and women who blow themselves up for the sake of a religion. They are promised some great reward in eternity; the men get 72 virgins, and I am not sure what the women get since their religion despises them. But the apostles and the millions, who have died for the name of Jesus, only had the Promise that they would be with Jesus wherever He is. Thus they died trusting that their greatest reward was simply to be in His presence. That is faith. God gives us this kind of faith. We see in Ephesians 2:8 that it says we are saved by grace through faith, and that faith is a gift from God. God does the saving; He extends the grace to us and He gifts us the faith to believe. Salvation is designed by, sustained by, provided by and gifted to us by God the Father. Since Jesus is our High Priest, He is our King and He is God in the flesh, then He and He alone can be the foundation of the NT church. There is a very large religion, that of Catholicism, that would have you believe that Peter is the rock of the church. He is not. Jesus is the Rock against whom the gates of Hell cannot prevail. “Let it be known to all of you and to all the people of Israel, that by the name of Jesus Christ the Nazarene, whom you crucified, whom God raised from the dead—by this name this man stands here before you in good health. In Ephesians 2: 20-22, Jesus is called the cornerstone upon whom the whole building is fitted together. 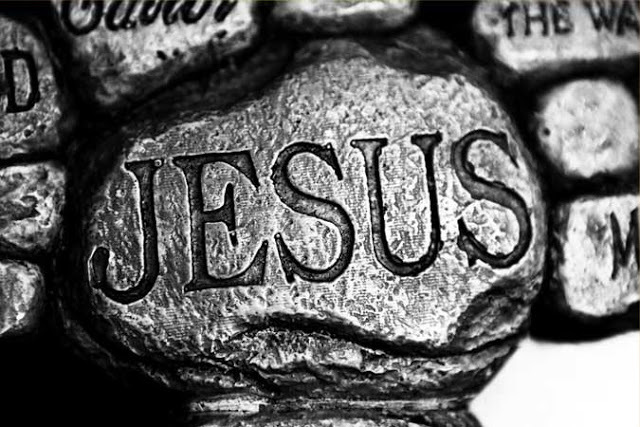 Jesus is the very foundation, the Rock and the Cornerstone of all that we have in God. In Jesus you have it all and without Jesus you have nothing. It truly is that simple. We should stop confusing people and should not tolerate those that do. We are not talking about some innocent mistake; we are talking about denying Jesus as the only means and way of salvation. This is from Hell. Think of all the people, some 1,000,000,000 worldwide who adhere to the Catholic religion— many who claim to believe in Jesus, yet they still worship the saints and Mary. They treat Mary as an equal with Jesus, but she is not; she was just a lost sinner who needed to be saved just like you and I. These people are lost and without Christ. This perversion is spiritual murder, and we need to be diligent not to fall for it, nor encourage it. In this age of the ‘COEXIST’ movement led by the Pope, the Lord’s NT churches need to stand up and make it clear that Jesus is the only way! No exceptions, no excuses, and no apologies.